Home » Textile & Fashion » Category "Dyeing"
Apparel Dyeing is a process by which color is applied on apparel. Basically through the dyeing process color is applied on fabric. Dyeing is used for giving fashionable look on fabric, and using these fabric, garments manufacture denim, t-shirt, sweater, Shirt, jackets etc. To produce fashionable garments by changing the outlook. 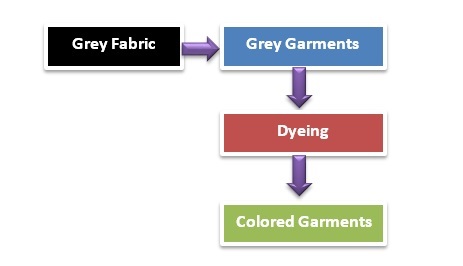 Mainly dyeing process is applied on grey fabric and after completing the whole process we get colored fabric. But remember one thing that after Dyeing you have to wash your fabrics. If closely see the flow process of complete Dyeing of fabric, then you may identify the following procedure. 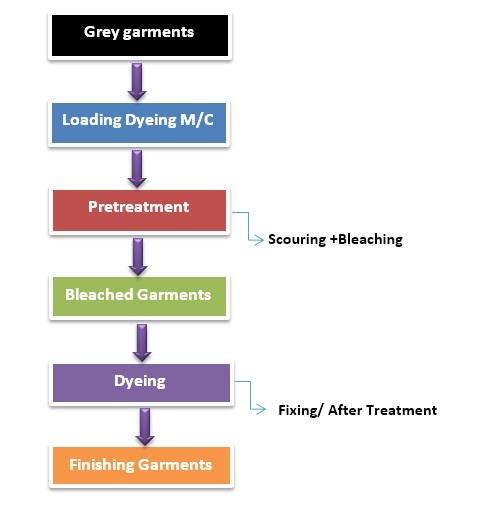 Earlier I said that Dyeing process starts with grey fabrics/garments then loading into Dyeing machine, after that pre-treatment and bleaching garments, then Dyeing, fixing (after treatment) and finally we will get finished dyed fabrics. Bleaching is a chemical process which removes the natural color of Textile fibres. The fibre/yarns/ fabric become permanent white. It removes natural color from textile materials. 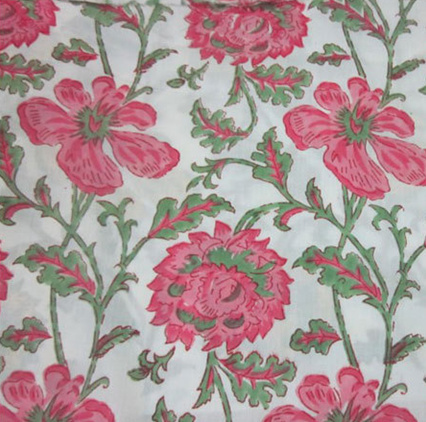 It brings the textile materials permanent white. Improve the absorbency of the textile materials. Produce the textile materials for the next process. Some fabrics are sold as bleached goods. Hand Bleaching: It is small scale production process for domestic and cottage industry. Before machine invention, it was practiced till it is in use. It is not defect less and controlled process. Machine Bleaching: It is continuous and discontinuous large scale production process. 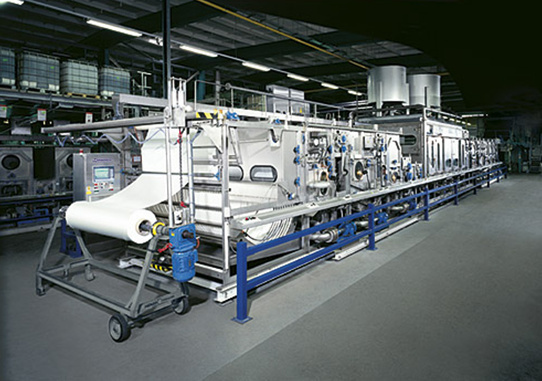 Modern textile industries are used this process. Machine bleaching us controlled and defect less. Production cost is less in machine process. The bleaching agents mentioned above all are not used only bleaching process. Some bleaching agents are very costly. Some agents cannot bleach completely. Reducing bleaching agents only used for protein fibres. Hydrogen peroxide can bleach all kinds of fibers. So, it is called universal bleaching agents. Oxidizing agents generally is used for cellulosic fibres. If reducing agents are used then after bleaching when fabrics come in contact with air they become yellowish or reddish that is come back to origin color. But oxidizing agents bleach goods free from this defect. So, goods become permanent white. Therefore Oxidizing bleaching agents are generally favored. Protein fibres wool and silk generally bleached with reducing bleaching agents. Because chlorine present in oxidizing agents damage proteins fibres without bleaching action. This is why animal fibres are bleached with reducing agents. Fibre types choice the bleaching process to be used. Generally need basis bleaching is made may be half bleach or full bleaching. pH of the chemical solution. 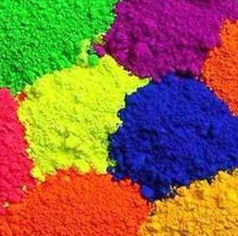 A dye or dye stuff is usually a colored organic compound or mixture that is used for imparting color to a substrate such as cloth, paper, plastic or leather in a reasonably permanent fashion. In other words, a dyed substrate should be resistance to a normal laundry or cleaning procedures. Dye can be synthetic or natural i.e. it can be collected from nature or can be made by chemical. Traditionally natural dye was used but in 19th century synthetic dye produced in a large scale and created demand in the market. Now for dying purpose most of the cases synthetic dye is used rather than natural dyes. Synthetic dye is human made dye getting very popular because of low cost and availability. White dye is one kind of commonly used dye. Some colorless compounds are used as the optical brightness. They may also be called white dye. They have the special properties of absorbing uv light & re-emitting the visible light so that the fabric appears bright Example: OBA that means optical brightening agent. Chittagong textile engineering college (CTEC) 6th batch.